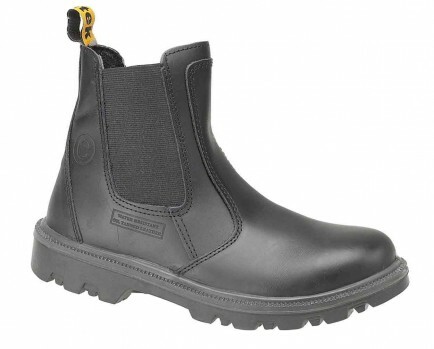 The Amblers FS129 is a black leather dealer boot with a water resistant upper which contains steel toe cap and midsole protection. The elastic-sided ankle high boot is tight fitting and includes a pull-on hook for ease of wear and removal. It has a rubber combined with polyurethane sole which makes it comfortable and lightweight. It features a shock absorbing heel. It is also available in brown (FS131).